Happy New Year everyone! Do you make any resolutions for the coming year of what you want to do in your garden? I rarely make resolutions and I certainly don't make any for my garden. I figure I don't need the added stress of not keeping a resolution! 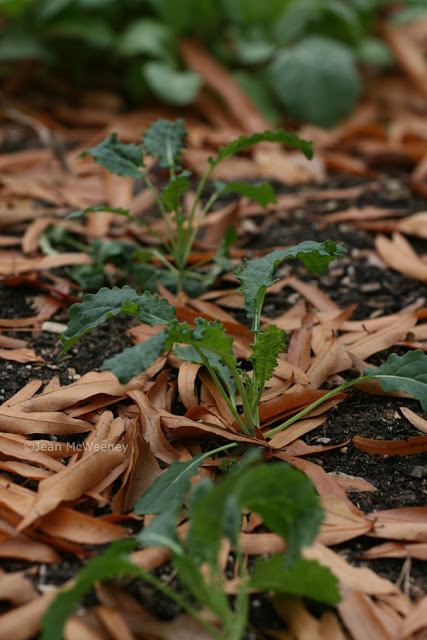 What do you do this time of year in your garden? Are you in it or just thinking about it? This time of year I'm usually just waiting and watching, wondering what will be starting to come up next and wondering how the garden will change. How do you like this blueberry? Such beautiful leaves. This is my first try at blueberries and judging by these leaves, I don't really care if I don't get any fruit. The leaves on this Bountiful Blue are gorgeous. Just before the holiday festivities I meant to do a post on all the lovely fall colors. I had forgotten how the oak leaves wait until December to really glow. But time slipped away from me and I never blogged about it. 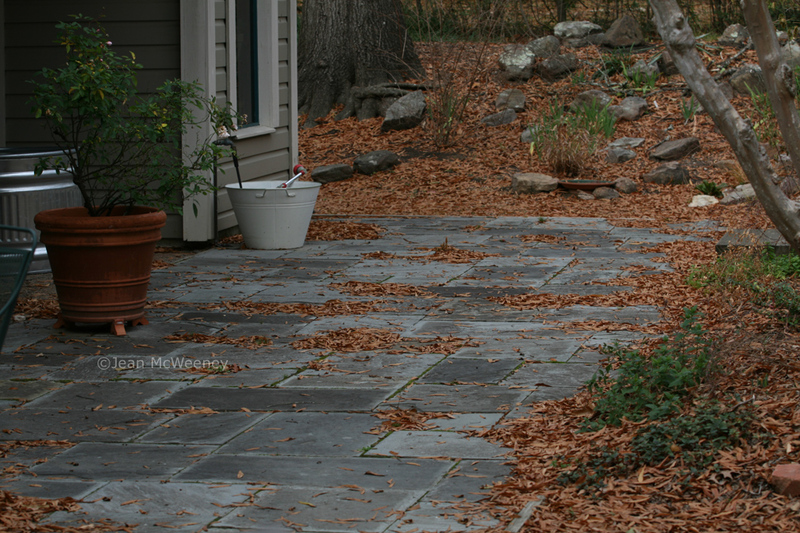 The day we got home from holiday travels ALL the leaves had dropped at once and now we've got some serious raking to do! Today, this first day of the new year, I decided to look for the new. 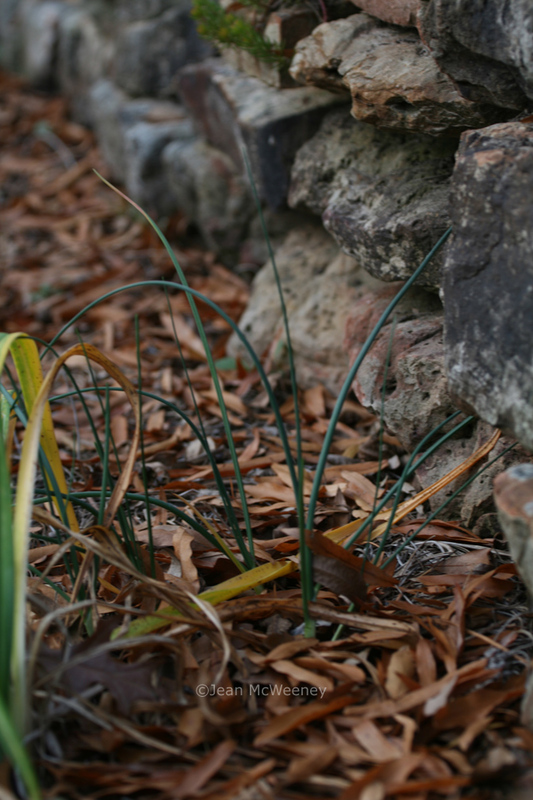 There are a few new leaves pushing up, including these drumstick alliums. When I ordered them this fall, the good folks at Old House Gardens emailed to make sure I wanted drumstick alliums. They're really not supposed to do well south of Zone 7 and I'm in Zone 8a. So I'm sure they were wondering if I knew what I was doing. Well, maybe I don't, but these guys do want to grow! Looks like the weeds want to grow too (my Greek grandmother-in-law probably wouldn't consider this a weed!). I have some young greens coming up as well. 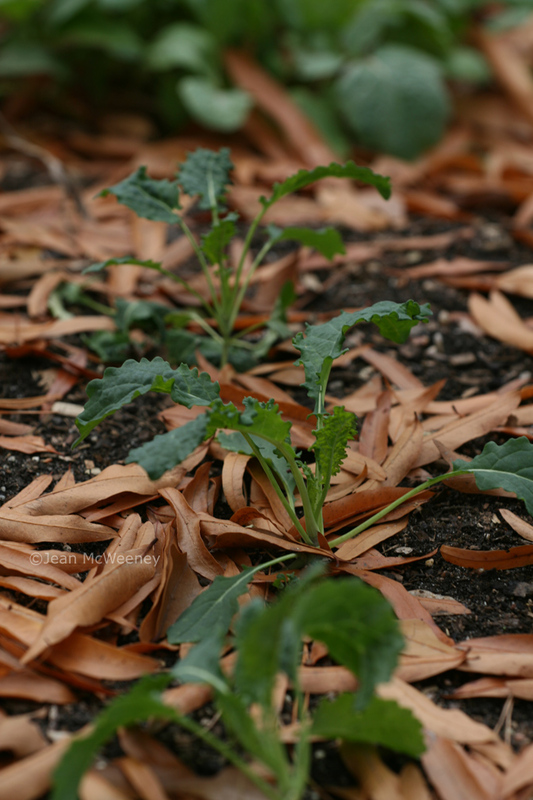 Can't wait for the kale to grow up. 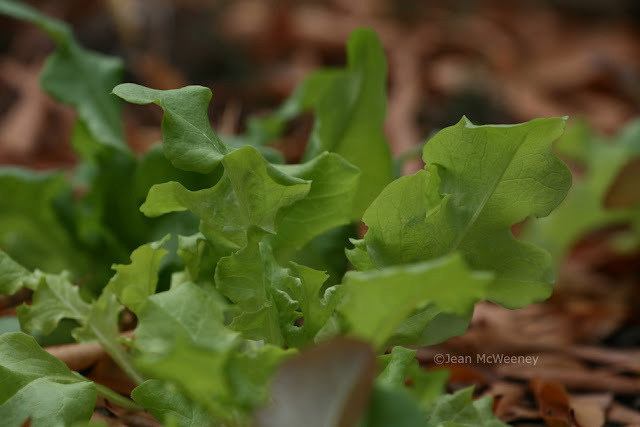 Last winter and this, I've used a seed tape of mixed lettuces to get a crop. I really like it as there's less waste. And lots of beautiful lettuces as well. Surprise, surprise, the quince has opened its first bud on this New Year's day. 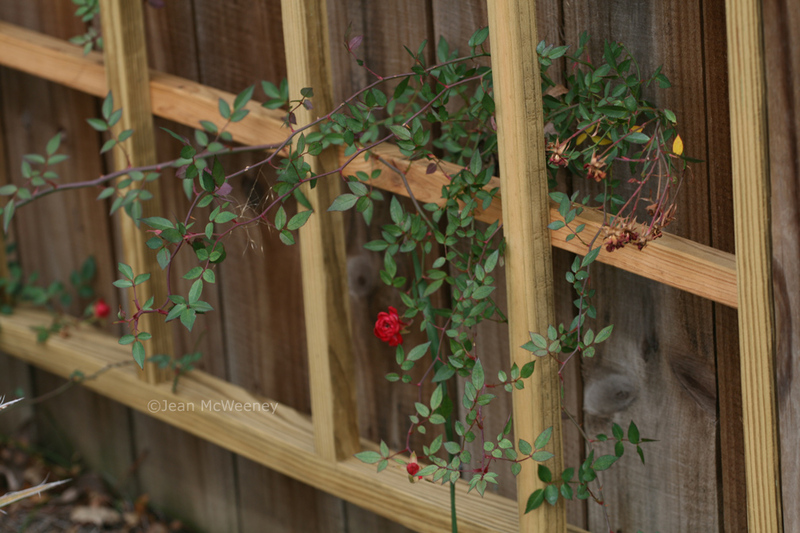 The Red Cascade climber has also surprised me with a few blooms. Finally, my sweet peas are coming up! This year I'm trying bird netting tacked to the ground and the fence. I hope this works. 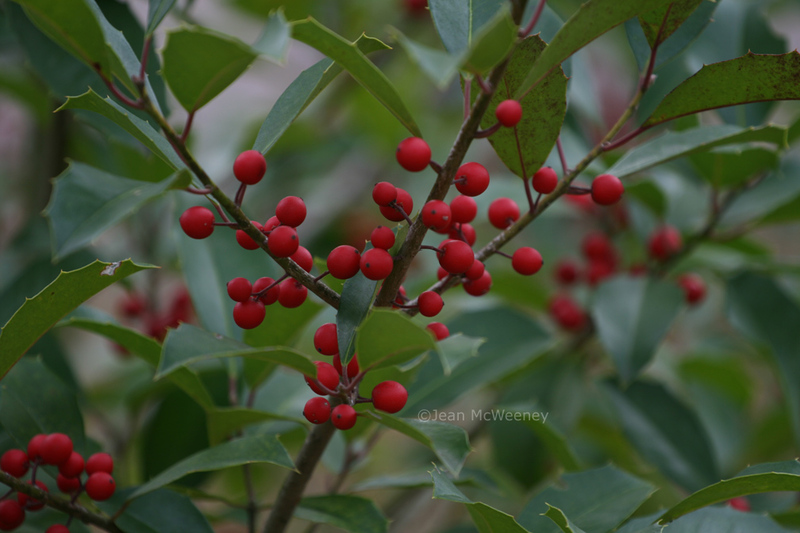 The Savannah hollies look pretty good this year and are full of berries. The mockingbirds won't eat them until later on in winter, giving me more time to enjoy them myself. Of course, one of my favorite "watching" activities this time of year is bird watching. The white-throated sparrows and juncos have returned. And the goldfinches are here early (only they didn't want to appear on cue for me). Could the indigo buntings and rose-breasted grosbeaks be far behind? Guess I'll just have to wait and watch. Love the blueberry bush! Very attractive. I like my blackberry bushes as well. The leaves are purple and red right now, and during the summer, they're a rich green. And wow, you got quite the flower on that dandelion! Impressive! That blueberry bush is quite lovely. I don't think ours survived, we shall see next spring. Happy new year! Yes, I'm thinking and planning and buying seeds now, January always gets me that way. Lovely quince flower, a quince is on my lifetime wish list. Happiest of New Years Jean! I love seeing all the life stirring in your gardens! Best Wishes for 2011! The blueberry leaves are very pretty. No resolutions this year! I will take life as it comes. Happy New Year! 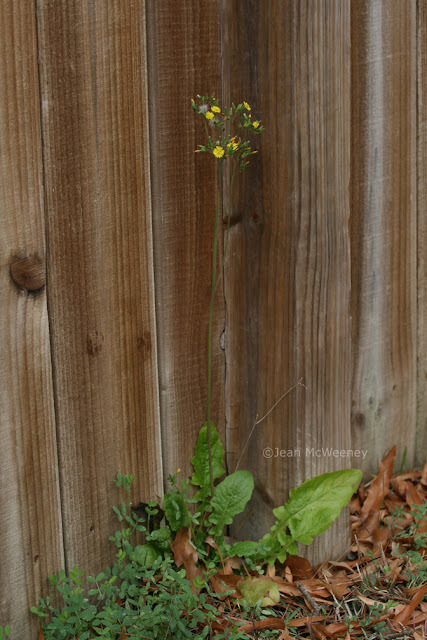 What a treat to visit your blog & see plants in bloom. Nothing's happening in my garden, it's all frozen (literally & figuratively), although there are buds forming on snowdrops and hellebores. I don't make resolutions, but I do make plans. I feel like I'm waiting and watching too. It's an in-between time, even for us in the Southern U.S. Your greens look great -- enjoy. Happy New Year's Jean! 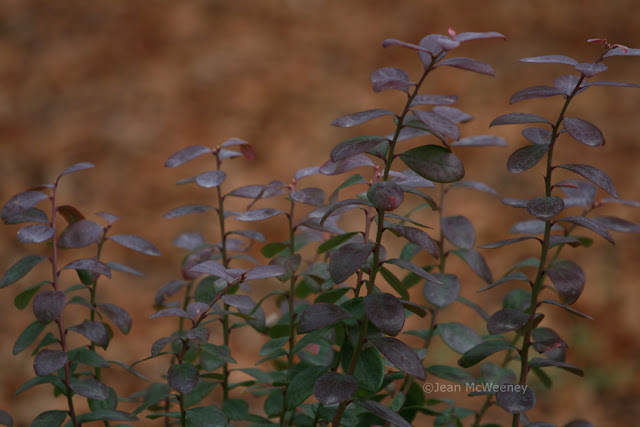 Your blueberry bush has wonderful leaves. I'll keep my fingers crossed for fruit. 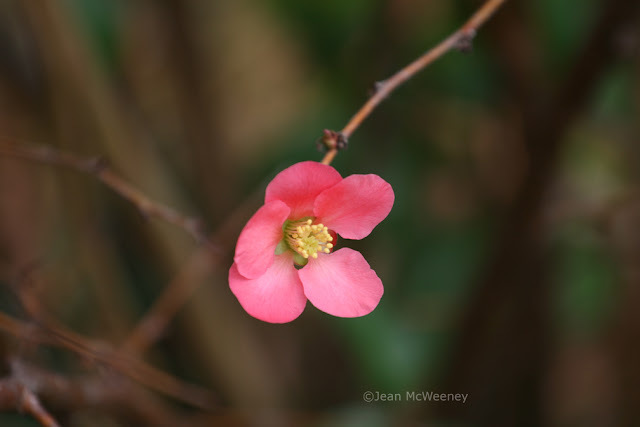 Your flowering quince is beautiful - what I wouldn't give to seem something in bloom in January! I think your gardens are looking lovely even with all the leaves. I was just thinking about getting a blueberry bush earlier this week. Growing up, there were wild ones that surrounded the lake where my parents had a cottage. We used to go out fishing and pull into sore every once in a while an pick blueberries without leaving the boat. I've got a spot where I could use a low bush, and obviously need a cold-hardy variety. It'd add to the other fruit I'm growing already - strawberries, blackberries, apples and pears. Remind me of this in the spring, will 'ya? 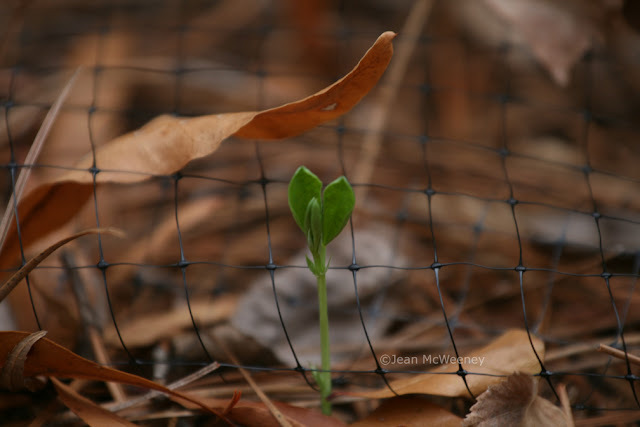 So nice to see all the new green growth in your garden, Jean! Now that we have a temporary respite from the snow, I walked around my garden today and found absolutely nothing. Even the hellebores have shrunk back after being buried in snow. This is the time of year when I'm not watching, but waiting. Spending time poring through garden books and seed catalogues, planning for spring. A lot going on in your garden Jean. Even if I didn't know you lived in 8a, I'd know you were south of me. We're still in winter's grasp and will be for awhile. Yo! Happy New Year to you and yours! 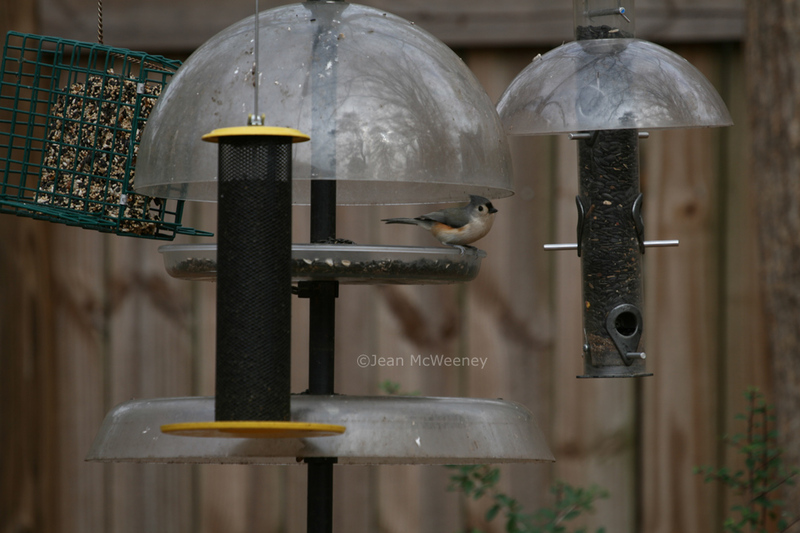 Please send a titmouse or two this way. I've never seen any at my feeders. The blueberry foliage is really pretty. I don't make absolute resolutions but am going to try not to lose my Felco's again this year! :o) I wish my garden was still green. It's sound asleep and brown, brown, brown! I've got local eggs - and snow. The blueberries are in the freezer.